Peace Magazine: Who's More Dangerous: A Nuclear Kim or an Erratic Trump? Who's More Dangerous: A Nuclear Kim or an Erratic Trump? The head-bashing between US President Donald Trump and North Korea’s Kim Jong-Un has got people worried about the real possibility of a nuclear war. From 2011, Kim Jong-Un has tested about 90 missiles, nearly three times what his father and grandfather tested, combined, between 1984 and 2009. Would Kim ever launch a suicidal nuclear strike against the USA, knowing that the retaliatory response would be immediate and probably also nuclear? Some believe that if Kim Jong-Un were to attack, it might more likely be south with artillery across the DMZ, and not nuclear. Metropolitan Seoul, a city of 25 million people, is within range. However, military agreements would guarantee a protracted conflict in which at least the USA would immediately be involved. Further, Kim’s bluster, while provocative and threatening, is seen by many as a rational response to the military exercises continued near the peninsular coast. These are annual, and not unusual, but the rhetoric of the US President who wants to shift attention away from domestic criticism is un-presidential at least, and more unhinged than “normal” US diplomacy and rhetoric. The South Korean President, Moon Jae-in, elected in 2017, has been more conciliatory towards Kim. Recently, the Republic of Korea (ROK) has asked the US to postpone joint military exercises until after the Olympics. Some say this confirms Kim’s claim that those exercises are not defensive but intended to be threatening. Kim now has a confirmed nuclear weapon and long range missile capability, although its reliability and accuracy are in question. Despite Kim’s threatening language, on good days it purports to be solely a deterrent against US military action. A nuclear-weaponized North Korea is seen as an inherent threat and a clear violation of numerous UN Security Council resolutions, although missile development has been ongoing since 1976, when Soviet designed (conventionally-armed) Scuds on Egyptian-made launch pads were first emplaced. There is no possible rational or legal use of nuclear weapons by either the USA or DPRK. Declaring nuclear weapon proliferation or possession illegal, whether through the NPT or the new ban treaty, is one thing. But states withdraw from treaties or don’t sign them, and getting the new or continuing nuclear powers to cooperate, de-escalate and step back is difficult. Perceptions of security, and egos, are usually on the line and wars have been started and fought over superficialities, including pastries, dogs, chariot races and pigs. [$1] Pig-headedness is not ruled out either. The legal argument against any use of nuclear weapons in any circumstance is that it would cause disproportionate humanitarian impact. This is well known by peace advocates and abolitionists. The International Court of Justice Advisory Opinion from 1996 narrowed the options further by including as illegal any “threat of use” of nuclear weapons. Moral authority was added in 2017 when Pope Francis, declared “their very possession” to be firmly condemned. The best hope might be that whereas Kim sticks to rationality (knowing a DPRK launch would be suicidal for his regime), Donald Trump’s more erratic recklessness will be constrained by advisors or allies or, worst case, a military leadership that refuses to obey an illegal order. Those however are not strong reasons for optimism. It is uncertain that a non-nuclear North Korea isn’t still feasible. That result is still desirable. In a statement last August, North Korea’s foreign minister, Ri Yong-ho following UNSC unanimously imposed sanctions, said: “Neither shall we flinch even an inch from the road to bolstering up the nuclear forces chosen by ourselves unless the hostile policy and nuclear threat of the US against the DPRK are fundamentally eliminated”. 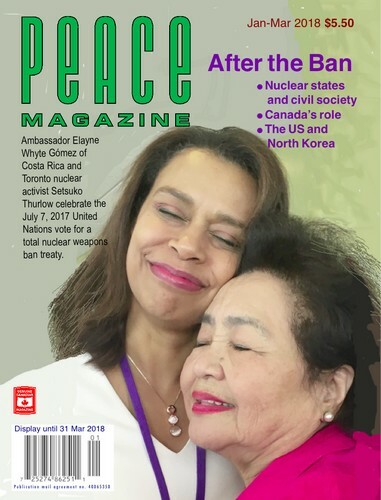 Canada doesn’t appear to be in the gun-sights of Kim Jong-Un, and this offers an opportunity for our own government to play its much touted, but less often seen, “honest broker” card. In September of 2017 it was claimed by Canada’s Lt. Gen. Pierre St-Amand (who is NORAD’s second-in-command) that the US would not be obligated to defend Canadian airspace if there was evidence of an incoming DPRK missile, and might allow the missile to drift in and detonate—assuming it was sufficiently north of the 49th parallel. Many found this unbelievable, and irresponsible fear-mongering. Global Affairs and National Defence officials have said the Kim government sees Canada as a “friendly and peaceful country”, and therefore a very unlikely target. Canada may therefore be in a good position to play an important role as intermediary. (There have even been Canadian government contacts made with the Cubans in pursuit of this effort.) One sequence might be for some face-saving mechanism to be arranged to allow the US to stop its military exercises with South Korea (and Japan) as part of the Freeze for Freeze proposal, possibly with international oversight. Then could begin destruction of some, if not all, of Kim’s nuclear force capability, with the goal of full elimination. But the North Korea standoff should be a potent warning to all nuclear weapon and “nuclear umbrella” states that their argument for indefinite retention of a nuclear deterrent—while expecting non-proliferation for everyone else, particularly small states or authoritarian regimes that perceive their security under threat—is unsustainable. Robin Collins is vice-chair of the Canadian Pugwash Group and national secretary of the World Federalist Movement-Canada. He lives in Ottawa.